Blockchains can be defined as immutable decentralised ledgers for recording transactions that - depending on the system - are to various degrees resilient to malicious behaviour. Blockchain peers maintain copies of the ledger that consists of groups of transactions (blocks) linked together into a hash-chain. This effectively establishes total order among blocks and, consequently across transactions. Transactions have in recent years evolved to allow the execution of arbitrary logic, also known as smart contracts. In principle, a smart-contract is an application that operates on top of blockchain, which uses the underlying ordering of transactions (i.e., consensus) to maintain consistency of smart contract execution results across peers, now also referred to as execution replicas. 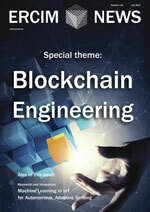 Exploring the real-world security of Bitcoin cryptocurrencies and alternative applications. We introduce SpaceMint, a cryptocurrency that replaces energy-intensive computation underlying most of today’s cryptocurrencies by “proof of space”. Once set up, SpaceMint consumes very little energy, which will motivate regular users to participate in the mining process thereby truly decentralizing control over the currency. Customisable proofs of work and memory hard functions are investigated by the SnT&CSC/CryptoLUX team at University of Luxembourg. Proofs-of-work (PoW) are at the core of most of the present day blockchains and cryptocurrencies. These are the tools that make large public distributed ledgers possible, since they replace the difficult to quantify and manage trust by hard to forge mathematical computations. Until recently, digitalisation in the public sector was characterised largely by making existing processes faster or more efficient. Blockchain instead is challenging established public structures. Currently publically controlled functions for interaction could be organised completely privately, which requires a repositioning of the state. At the same time, Blockchain provides a technological approach that can be used by the public sector itself to improve transparency and trust. As the notion of circular economy gains momentum, intelligent assets increasingly form the backbone of sustainable ecosystems. Although these assets can supply the necessary knowledge for fueling the value drivers of a circular economy, the generated value will be significantly amplified by allowing third parties to manage them and profit from better asset utilisation. However, for an ever-changing networked environment consisting of numerous assets, ownership needs to be dynamic, granular and adaptable in order to maximise gains. Blockchain-based mechanisms can effectively serve this need by enabling transfer of asset ownership directly between parties participating in the circular economy while introducing trust, efficiency and automation in asset exchange contracts. Use blockchain technologies while keeping the control of the transparency you provide! As part of the 2017 ERCIM spring meetings in Paris, ERCIM held a half-day workshop on blockchain technology on May 23 2017. Co-chaired by Georges Gonthier (Inria) and Wolfgang Prinz (Fraunhofer FIT), the workshop provided a high-level overview of blockchain technology and its opportunities for computer science research to the senior-level workshop attendees. The attendees included executives of ERCIM member institutes as well as a number of researchers. Researchers from INESC-ID, Instituto Superior Técnico, University of Lisbon proposed a set of fundamental Cache-aware Roofline models, which provide a simple and intuitive way of visually representing the limits of parallel processing on multi-core processors. Researchers from ISTI-CNR, Pisa (in a joint effort with the Qatar Computing Research Institute), have undertaken an effort aimed at producing more accurate and more efficient means of performing poly-lingual text classification, i.e., automatic text classification in which classifying text in one language can also leverage training data expressed in a different language. The purpose of virtual research environments (VREs) is to support research stakeholders throughout the research life-cycle. In order to describe the expectations and requirements at each stage of the life-cycle, high-level use-cases have been developed in the VRE4EIC project, which has developed a Europe-wide interoperable VRE to facilitate innovation and collaboration between multidisciplinary research communities. The ElasTest project, with an € 5M of EU funding under the Research and Innovation Action from the Horizon 2020 program, kicked-off in January 2017. The goal of ElasTest is to increase software quality by reducing the complexity of testing large distributed software systems in the Cloud. The project is led by the Spanish University Rey Juan Carlos (Prof. Francisco Gortázar) and involves the Technische Universität Berlin, the Consiglio Nazionale delle Ricerche, the Zurich University of Applied Sciences, the Fraunhofer FOKUS, the IMDEA Software Institute and the following industrial partners Atos Spain, IBM, Naevatec, and Relational. IFIP Networking 2017 took place in Stockholm at KTH, the Swedish Royal Institute of Technology, from 12-17 June. The conference’s aim was “The future of networking: Defined by software, driven by data and designed for all” and consisted of workshops, regular lectures and poster sessions. As is our aim in the IFIP Technical Committee 6 (Communication Systems), the papers are published in our open Digital Library, http://dl.ifip.org. There is no printed version of the conference papers; the Digital Library serves as the conference record and papers were made available several days before the conference opening. Access is free to everyone. The Ministry for Education, Culture and Science in the Netherlands has awarded a Gravitation grant for large-scale research on quantum software in May. The grant of 18.8 million euro unites researchers from QuSoft, CWI, Leiden University, QuTech, TU Delft, UvA and the VU in pursuing state of the art research programmes in this new field. It allows the consortium to pioneer quantum software for, for instance, small quantum computers and a quantum internet. It will develop protocols for quantum communication, and for a new type of quantum-secure cryptography. These methods can be tested on quantum hardware that is developed in parallel in Delft and Leiden, and a quantum network between Amsterdam, Delft, Leiden and The Hague. In May, demissionary Secretary of State of the Netherlands Sander Dekker opened the ‘FleX-ray Lab’ at CWI. With the new state-of-the-art CT scanner of this lab, it will be for the first time possible to look inside objects in 3D during the scanning process, and to adjust or zoom in while scanning. Dieter Fellner replaces Matthias Jarke on the ERCIM AISBL Board and the ERCIM EEIG Board of Directors as representative of Fraunhofer-Institut and Dimitris Plexousakis, succeeds Constantine Stehpanidis on the ERCIM EEIG Board of Directors for FORTH-ICS.